This pressure cooker thing has been bugging me so I thought I'd remake the recipe in a Remoska, a Czech tabletop cooker that also claims to be energy-saving. I tweaked it slightly, leaving out the mustard and adding a bit of chorizo but the whole thing was much, much tastier than Saturday night's effort. OK it took longer - about 40 minutes - but I didn't have to do anything while it was cooking. I also rescued the leftovers from the abortive pressure cooked chicken by taking the chicken off the bone, putting it back with the onions and stock, heating it up and stirring in a good dollop of wild garlic pesto I bought at the Love Food Spring Festival at the weekend. 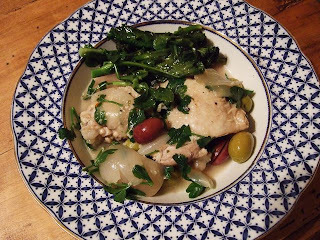 This transformed it into a really quite passable chicken and wild garlic soup. I can imagine poaching (note, poaching not pressure cooking!) a whole chicken and serving it with new potatoes and spring veg, the chicken broth and a dollop of wild garlic pesto - like a cross between an aioli and a salsa verde. 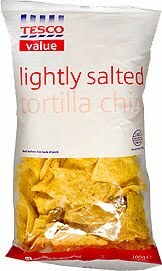 Anyway this is my adaptation of Richard's original recipe. 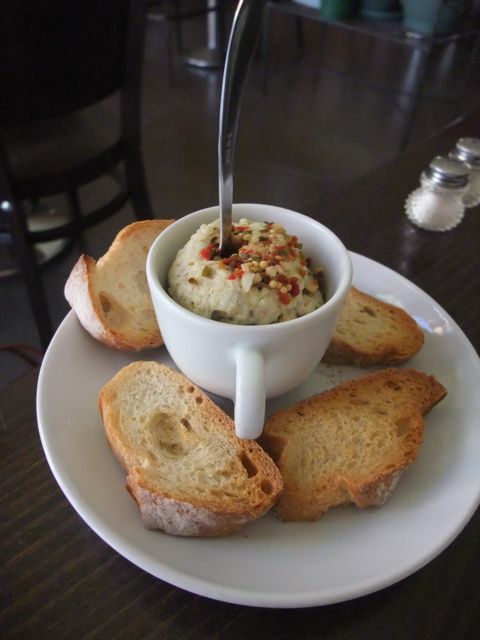 For the Remoska or oven, not for the pressure cooker, if you please . . .
Heat the olive oil and fry the chorizo until the fat starts to run. Remove with a slotted spoon and set aside. Season the chicken pieces with salt and pepper, brown on both sides and place in the remoska or a casserole. Quickly fry the onions in the chorizo-y oil then stir in the garlic. Tip in the sherry and bring up to the boil then add the stock and pour over the chicken. Stir in reserved chorizo and the olives. Cook for about 40 minutes in the Remoska or cover with a lid and place in a low oven until the chicken is nicely browned. Stir in the chopped parsley and serve with rice. Ever since I last blogged about pressure cookers (three years ago I discovered, to my amazement) I’ve had this sense of unfinished business. 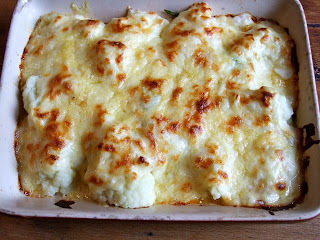 They are such a frugal way of cooking it seemed wrong not to give them another try. 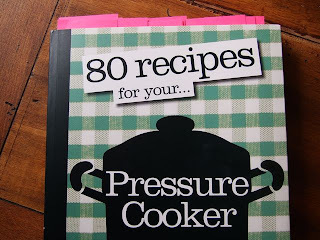 I was prompted to have go by the publication of a really inspiring book by my colleague Richard Ehrlich called 80 Recipes for Your Pressure Cooker. Now you can see how many of the recipes I fancied from the number pink post-it notes marking the pages. I really thought this was going to be it. The big breakthrough. I unearthed the pressure cooker from the back of a cupboard, dusted it down, managed to find the instruction book (no small feat) gave it the recommended checkover and was ready to go. 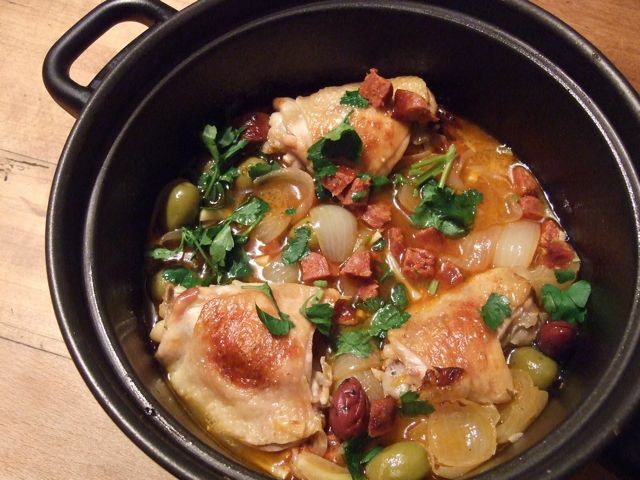 I chose a delicious-looking recipe for chicken with sherry, mustard and olives as I had most of the ingredients and followed the instructions to the letter. Everything seemed to go fine - the pressure indicator went up, steam emitted, the cooker burbled comfortingly - the 10 minutes recommended cooking time was up and .... the chicken wasn’t cooked. The end result while looking just about presentable was almost inedible. The skin, despite the fact I’d browned it, was wet, limp and colourless. The onions were devoid of flavour. No taste of mustard, olives or even sherry despite the fact I’d used the full 100ml Richard recommended. My husband laboured manfully through it but basically it was crap. * Richard’s recipe didn’t work. No way. It sounded good - it should have been good. I’m sure if he’d made it it would have been good . . .
* Pressure cookers and I are just incompatible. The most likely explanation. I’ve never liked microwaves either . . . 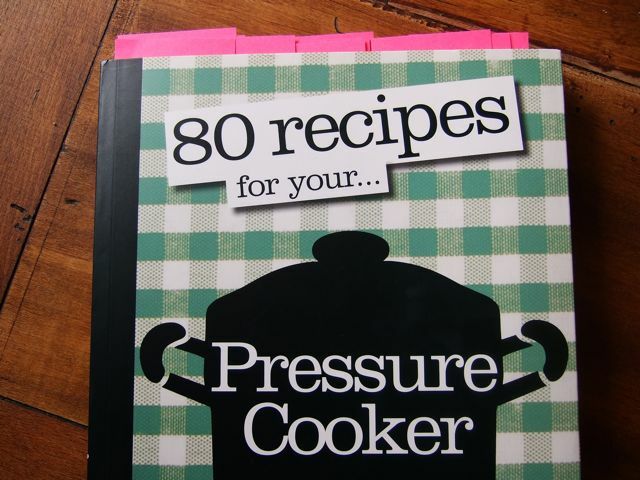 Anyway if you ARE a pressure cooker fan let me recommend the book. 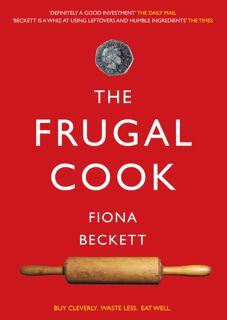 It’s got lots of lovely frugal - and not so frugal recipes - in it I can’t wait to try including a couple of cracking meat loaves, a great-sounding shin of beef with an Asian dipping sauce you seem to be able to rustle up in a quarter of an hour and an awesome New England blueberry pudding. Only I’m going to have to find another way to cook them. So, you pressure cooker lovers out there - what do you think I did wrong? And tell me why you like yours? I had to spend last week unexpectedly in France for a family funeral - hence the absence of posts - but we went out for the odd meal and I was very taken with the presentation of this fish paté which was brought to the table as an 'amuse' at a restaurant called Larcen. My guess is that it was whizzed up from some leftover cooked fish along with some spices, a few cooked chickpeas or haricot beans and - I think I heard the waiter saying to the next door table - some mayonnaise. Looks like there was a bit of finely chopped red pepper and cornichon on the top and possibly even some grains of quinoa (or that could have been what was blitzed with the fish). Add a few baked or toasted slices of leftover baguette and you've got yourself a pretty and ridiculously inexpensive starter. Still catching up on the work I missed last week but hopefully normal service will resume shortly . . .